Spring is the season to check the viability of your cooling system hoses. The hoses are a vital component of your car’s circulatory system. 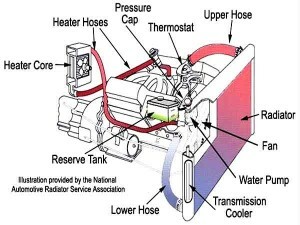 By carrying hot water away from the engine into the radiator to be cooled, the upper hose is especially prone to stress. The lower hose carries the cooled water back to the engine. The primary symptom of a bad hose is an overheated engine. The rubber hoses of the cooling system are subjected to temperatures in excess of 100°F. On cold winter mornings, this temperature is reached in under 5 minutes – which exerts a great deal of stress on the hoses; which is why Spring is the best time to inspect your cooling system for stress wear and loose hoses. Bulging – an indication of imminent failure! Always remember: When in doubt – take it out! While replacing worn hoses is a relatively simple operation, Everett Radiator Repair can replace any questionable hoses – they will even do a thorough test of the cooling system – especially if you aren’t comfortable assessing the situation yourself. Should you decide to replace the hoses yourself, the easiest way to insure that you purchase the correct hoses is to remove the worn ones, take them to an auto supply shop – let the experts determine which is the best replacement for your car. Be certain to purchase requisite hose clamps as well – the old ones will likely be showing signs of stress! Wipe all dirt, grease and other debris from the hose connection and replace with the new hoses that have been cut to length as required. Tighten the hose clamps and presto-chango your car’s cooling system hoses should be good for another year! If it makes you more comfortable, have the technicians at Everett Radiator Repair & Service check the hoses every time you have your oil changed.